On the occasion of his birthday…. Jimmy Page is 70 today (January 9th). In a career that has spanned over six decades – he has simply written the rule book on the art of rock guitar. From monolithic riffing to bombastic solos. From simple acoustic beauty to vast guitar instrumental orchestration. Jazz, classical and Eastern influences, Blues, 50s rock’n’roll and psychedelic – he has turned his hand to all these varying styles over the years. At times his playing may seem sloppy and seemingly undisciplined but that is all part of the attraction. Always inventive and with a brilliant ear for production values, Jimmy Page is the epitome of the phrase ‘’Tight But Loose’’ that he coined to describe Led Zeppelin’s music. He may not have been too active performing wise in recent years (though the forthcoming Led Zeppelin re-issues will be evidence enough that he has not been idle), but for me and countless thousands of fans the world over, he remains (as that flag out in that field near Stevenage once proclaimed) the true Lord of the strings…. The response has been fantastic and as promised, today we reveal the results. On a scoring basis of ten points for a number one choice, nine for a number two etc – we have collated your All Time Top Ten Jimmy Page performances and the results are below. Each category is followed by a sample of the many top ten listings we received. 2. White Summer (all acoustic version) – Little Games – bonus track on the deluxe release from some years back. Beautiful. 3. You’re A Better Man Than I/Heart Full Of Soul – Live Yardbirds – A stunning tour de force by Mr. Page. Here are my suggestions regarding Jimmy’s Yardbirds work. I’ve put in a couple of tv versions of songs -Just had a great night listening to all this wonderful music. First time in a while I’ve listened to so much of it in one sitting. Still stands the test of time – no problem. Dazed and Confused – Bouton Rouge TV Programme – Everything’s in place arrangement wise and the ‘bow-to-lead solo’ link, the glissando and power chord, always thrills!! Think About It – BBC Session/On Air CD – powered by Jim M’s drumming, Mr. Page plays beautifully. I love this version. Tinker, Tailor, Soldier, Sailor – Little Games – As with a lot of the tracks on ‘Little Games’, the arrangements do feature the ideas that were to be developed over the next 12 months. Great rhythmic work from JP. Drinking Muddy Water – The Yardbirds still Blueswailing, Very nice guitar work on this. Glimpses – Very ‘of its time’ but experimental and captures the essence of some aspects of the stage shows of the time. Train Kept-Rollin’- Bouton Rouge TV. Not only a great version of this track but we also have Jimmy in all his finery. Superb! 1.Since I’ve Been Loving You – there’s blues songs and then there is this. Nothing quite like it in my opinion. The feeling from Jimmy’s playing on the original is just exquisite throughout and when it comes together with the rest… well. 3. Down by The Seaside – from my favourite side of an album. So different and so gentle with Jimmy stepping it up to provide such a fitting contrast and then it all comes back down again. 4.Bron-Yr-Aur – what an acoustic player. He’s so good at it and it’s throughout so many songs but often augmenting other parts. This being the only one with only him needs to be recognised for its qualities that take you off somewhere for a short while and so that this talent doesn’t get lost in the wealth of his riffs and tricks on the electric. 5. Bron-Y-Aur – From my equally favourite album. Just feel good with his picking leading you into a smashing song. I could have chosen any of the acoustic on III as they are all so good. 6. Over the Hills and Far Away – was there ever a song that steps up so well: from melodic six string acoustic to twelve string to then hit you with such a raw bang of electric guitar. The sonic contrast he obtains at that point with the electric is just immense. Then it gets into the strangest solo that goes off on its own somewhere before realising it has to some back but is not sure how to. Don’t know how a drummer could create a rhythm to match – well obviously we do. 7. When the Levee Breaks – renowned for the drumming but the slide guitar, the effects and playing are just as important and equally make this a masterpiece. 8. Hots on For Nowhere – never hear this mentioned, underrated. A song where the riffs and drumming work so well together. 9. Ten Years Gone – multi layered magic. 6. Heartbreaker – now here is the ultimate guitar track! 3. The Rain Song – the LP that was considered a “disappointment” at the time contributes 3 songs to this list, but the songwriting on the album is simply Page at his peak, and his playing here, particularly on the coda, was never more elegant. And someone I hold in very high esteem tells me this is the greatest Zeppelin track ever, so there it is. 1. Kashmir – Didn’t ‘someone’ once call this the pride of Led Zeppelin? Can’t argue with that can you? A creative pinnacle. 2. Stairway to Heaven – As a song growing from a basic idea built around an A minor arpeggio to the finished arrangement – the 12 strings, the pedal steel ‘weeping’ refrains etc – I think this shows the full scope and range of J.P.’s musical vision as writer, arranger and producer. Peerless. 3. The Rain Song – The interwoven mix of acoustic guitars, 12-string guitar and strings makes this a true highlight of ‘Houses of the Holy’. 4. In the Light – One of the most adventurous tracks on ‘Physical Graffiti’. Still sounds great today. 5. Since I’ve Been Loving You – Classic Blues, classic performance and classic solo. 6. 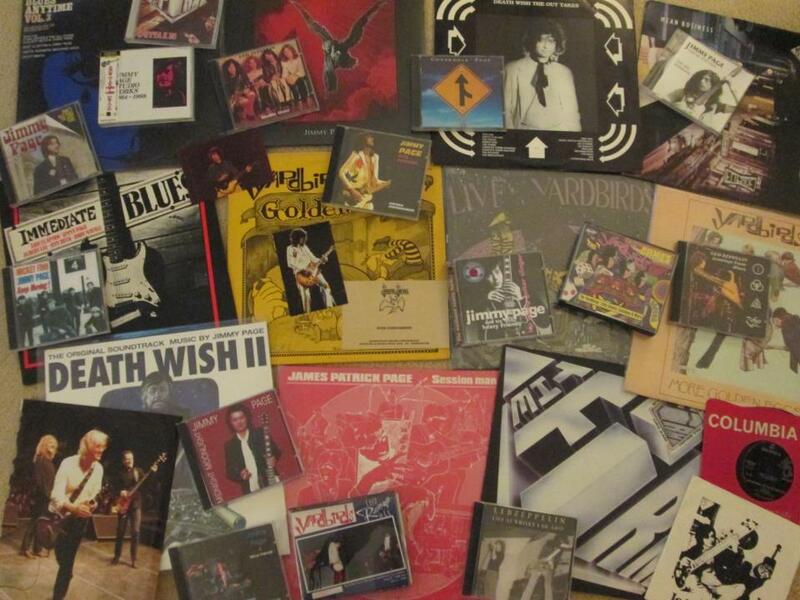 Ten Years Gone – The ‘Guitar Army’ in full flight. 7. When the Levee Breaks – One of Rock’s monolithic tracks – the drums, the slide guitar, the build-up. 8. Achilles Last Stand – Stand-out track from ‘Presence’. Visceral intensity and a solo packed with emotion. A mid-career highlight. Who else would have thought of this? 9. Tangerine – Simply a beautiful song with a wonderful arrangement. Clearly, a forerunner of ‘Stairway’ and has all the same elements in the mix. 10. In My Time Of Dying – Probably my most played track – and side one of this album probably rates as the most played – by any artist over the last 38 years. This is more of a ‘captured-live-in-the moment’ track as opposed to a studio ‘creation’ but it shows the band at it’s best. It’s live, it’s exciting, it’s dynamic it has one of the most powerful drum tracks ever committed to tape and Jimmy’s slide playing is off the cuff, wild yet structured…dare I say ‘Tight But Loose?’ (Sorry, couldn’t resist that). 7. Tea For One – hard to have both SIBLY and TFO in this list as they are cut from a similar cloth, but Tea is the quiet gem that closes my favourite Zep album so I can’t choose between them! 10. Black Dog – pure filth! ’nuff said! First of all I must say I think your own selection is great – actually pretty close to my own, and it certainly includes his best solos, apart from perhaps Tea For One. ITTOD was inspired and led by Jimmy less than the earlier albums, and while it’s still a good album, I don’t think it would be unfair to say that it was noticeably weaker on the whole. That may be why people often don’t remember I’m Gonna Crawl. But even if Jimmy’s role was different on that album, his work there is often brilliant, and the solo on I’m Gonna Crawl is one of these moments where his unique imagination really comes through. Astonishingly beautiful. Again, while Ramble On isn’t a personal favorite and I wouldn’t rate For Your Life quite this high on a list of this type (I’d still rank it pretty high), my selections are pretty similar to yours. However, I feel the list understates his acoustic work a little. The simplicity and beauty of Bron Yr Aur seems worth including to me – the live Blueberry Hill version is great, but doesn’t better the exquisite studio version. As for Black Mountain Side, although the studio version has a quality of its own, it just seems more interesting within the context of the live combination with White Summer, where it sounded less Indian and took on a bit of a frantic aspect. Whole Lotta Love – The first Zep song I ever heard and life has never been the same since somewhere around the early 70’s. Peerless riff. Gallows Pole – Maybe a less than obvious choice, but seriously, seriously original. The guitar army is out in force on this one. In The Evening – The revelation of August 4th 1979. Has continually grown in stature ever since. The intro is as uniquely Page as it is remarkable. No question one of his finest moments. In My Time of Dying – For me, this was the big highlight of 02, along with Kashmir, but for this exercise we are looking at the absolutely blistering Physical Graffiti original. I seem to play this more and more as the years roll by. It has everything and, like so much of Jimmy’s material, is unlike anything you’ve ever heard. Communication Breakdown – Riffmeistership at its most economical and devastating. The blueprint for so much that followed in the rock genre. Since I’ve Been Loving You – His bluesiest outing and some of his very best playing. Kashmir – Perhaps more original, inventive and devastating than any other guitar performance in history. Stairway to Heaven – The Lionel Messi of this list – the first player on the sheet. I’m Gonna Crawl – What a way to finish their last studio album. His playing on this track is right at the summit. Achilles Last Stand – It doesn’t get better, because it can’t. 8. 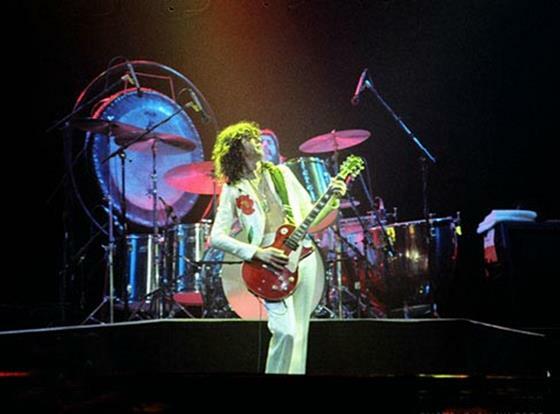 Since I’ve Been Loving You – The Song Remains The Same film – several of the most perfect minutes of Led Zeppelin ever. Period. 5. Communication Breakdown – Osaka, September 29, 1971 – rarely did a Zeppelin concert feature more incredible improvisation than this one, and Jimmy leads the band into a long, careening roller coaster ride as the song barrels out of control toward the finish. Incredible! 4. Killing Floor – Winterland, San Francisco, April 26, 1969 – one can only imagine the shock and devastation of the pulverized Deadhead hippies in the crowd at the end of THIS!!!! 2. Immigrant Song/Heartbreaker – Berkeley, September 14, 1971 – another cheat, but I can’t help it, this is one and the same…Page at the peak of his powers from possibly the greatest Zeppelin bootleg LP…and it always sounds fresh! 10. Whole lotta love (LA Forum June 25 1972). Here’s my choice for ten great live performances from Jimmy with Zeppelin. So many others missed off but I think this is a pretty good overall selection. 1. No Quarter – From the original vinyl album ‘ The Song Remains the Same’. Perfect. The build-up from nothing to solo climax linked to the wonderful drumming of John Bonham is a great example of JP at his live best. 2. Thank You – L.A. Forum 3rd June 1973 from ‘Three Days After’ cd. Magnificent. The power and Glory of 1973. 3. Dazed and Confused – Earl’s Court, May 24th 1975. It never got better than this. Compare this to the next night’s version. This is slower in tempo, darker, more ominous and menacing…the Sunday night version was the opposite – more vibrant, full of energy ‘lighter’ as was the whole gig – but equally as good. I could have chosen either but this version has it all. 4. As Long as I Have You – Filmore West April 27th 1969. Perfect embodiment of the improvisational Zeppelin in their early days. Page’s playing is ferocious. 5. Nobody’s Fault But Mine – Knebworth, August 4th 1979. Back on form. To me, this is one of the first peaks of this show. It was a stunning version and JP’s guitar sound is vicious!!! Great energy from all of them but the rhythm guitar is magnificent. Great solo too. 6. Whole Lotta Love – Berlin July 7th 1980. Proof, if it were ever to be needed, that this band still had places to go. The instrumental work out in this is fantastic. Reminds me of May 25th 1975 in that it seems they didn’t want to stop playing at this point. Fresh, vibrant and clearly, great fun for the band. 7. In My Time of Dying – Earl’s Court, May 24th 1975. DVD. 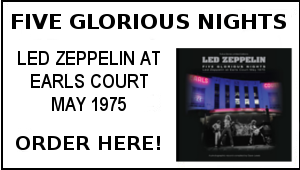 Hard to choose any specific version of this song – Madison Square Garden, June 7th 1977 or Vancouver 19th March 1975 have to be contenders but Earl’s Court wins out. 8. White Summer/Black Mountain Side/Kashmir – Knebworth Festival August 4th 1979. Memory, Audio/visual bootleg(s) Probably my personal highlight from this gig. To be actually a part of the audience listening to this being played was – and still is – amazing. I always loved ‘White Summer’ but this was the first time I saw and heard it played live and when the band kicked-in with Kashmir it was a moment to remember. 9. Over the Hills and Far Away – Earl’s Court, Sunday May 26th 1975. What a guitar solo! 10. 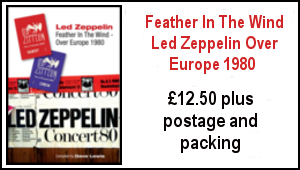 Whole Lotta Love and full Rock’n’Roll medley – BBC Paris Theatre 1971. I’d have to acknowledge the Rock’n’Roll medleys that were so great to hear at this time. This one is a firm favourite – Honey Bee, Mess of Blues, For What it’s Worth, Fixin’ to Die, etc. Wonderful. 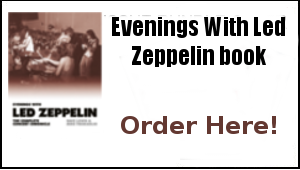 * I tried to refrain from selecting Zep tunes in their post-Zep incarnations, but one can only resist for so long! 1. Hummingbird (from Outrider): Simply amazing to me. When Jimmy’s second lead passage launches — deep, full and rich — it is such a fulfilling antithesis to the earlier sharp, treble, cutting phrasing as to resonate deep down in one’s soul! 2. Tulsa Time (Live at the ARMS Concert 1983, Royal Albert Hall, London, with Eric Clapton, Jeff Beck and entire crew): Far outshining the obligatory “Layla”, Tulsa Time lets the three guitar greats swap improv solos. Jimmy is afforded a huge circle on the stage as he swaggers and staggers about, wrenching amazing, edge of the precipice leads. After one of his passes, Claptin seems to look on in amazement, and just shakes his head at Page. It’s clear Jimmy is pouring all he has into this performance. 4. When I Was A Child (Walking Into Clarksdale): an amazingly subtle electric performance from Jimmy; spare, nuanced, opened up in the chord phrasings to allow the spirit b.ow through this eloquent song. 6. Jam Sandwich (DW2): Loved this rock-jazz number and the classic Page lead. 7. Prelude (DW2): A heart-rending electric adaptation of Chopin by Jimmy. Often overlooked, but really quite effective. Very dramatically done at the ARMS Concert 1983. 8. Wanton Song (from the Page-Plant tours): Much quicker tempo than the Physical Graffiti version, and really muscled up for the tours. Always amazing on all the YouTube versions and TV appearances I’ve seen. 9. Ramble On (Foo Fighters Live at Wembley, with Jimmy & JPJ): Wow. 10. Ramble On (from It Might Get Loud documentary film): The surprising intimacy and gentleness of the opening chords in this extemporaneous rendition, seem to convey better perhaps than any of the previous forty years’ versions Jimmy’s approach of chiaroscuro, balancing light and shade, bright and heavy. The whole film is a marvel, but this stood out to me as the chords happily washed over us. Here are my choices for 10 of my favourite tracks across the range of work Jimmy has undertaken since 1980. 1. Wasting My Time – Outrider; Strident, powerful and loud. Love the mix of guitars on this. Maybe a bit ‘under produced’ but has a great raw quality to it. 2. Who’s To Blame – Death Wish 2 Soundtrack; Great opener for the film and the album. Nice twists and turns in this. Love the live versions too – ARMS gigs etc. 3. Burning Up – Walking into Clarksdale; I think it was Nick Kent who once used the description ‘…a full throttle rocker…’ and I’d say that’s a fitting description. Great version of this on ‘Later’ too – with you bopping away on Jimmy’s left as I recall. 4. Midnight Moonlight – The Firm; I’m sure we’d all have loved this had it been completed and released in its original form with Zeppelin but I still love this version and the subsequent live performances from 1984 onwards. 5. Take Me For a Little While – Coverdale Page; A great album with both of them back on form. I think this shows Jimmy’s influence in the superb arrangement. 6. Shake My Tree -Coverdale Page; Great opener from the same album. What a riff. 7. Prelude – Death Wish 2 Soundtrack – Short but sweet. I think I first heard this on Tommy Vance’s ‘Friday Night Rock Show’. Again, loved this live on the ’88 solo tour. Haunting. 8. Absolution Blues – Great use of the Transperformance guitar on the opening of this. Loved the way it was incorporated into the live ‘Shake My Tree/theremin solos’ on subsequent tours. Really great. 9. Prison Blues – Outrider; Great Blues, great playing, great solo. Again, a bit raw but suits Chris Farlowe’s vocal approach perfectly. 10. 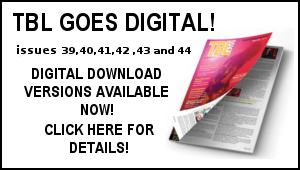 Thank You – Unledded and subsequent tours. This song, to me, became one of the great highlights of the live tours with Page and Plant. Special mention must be made for Milwaukee and Albuquerque versions – unbelievable solos. Could have chosen anything from Unledded as it was – and remains – a magnificent testament to the legacy of Led Zeppelin in all its forms. 1. Hummingbird – Outrider – That jump off into the short solo at 1:53 – that’s pure Jimmy and a highlight in a song filled with highlights. 2. Thank You – No Quarter – The new solo at the end gives the song a whole new personality which even manages to enhance the original. 3. Cadillac – The Firm Mean Business – The guitar sound is absolutely filthy and shouldn’t work with a voice as pure as Paul Rodgers’, but it does! 4. Walking Into Clarksdale – Walking Into Clarksdale – Superb riffing – an under appreciated record I think and this was my favourite track from it. 5. Live In Peace – The Firm Mean Business – A bit predictable in song structure, but I’m a sucker for tracks that start with a solo piano and end with a massive guitar solo! 6. Since I’ve Been Loving You – No Quarter – True to the original, whilst adding something that acknowledges the past but refuses to be confined by it. 7. Writes of Winter – Outrider – Another standout from Outrider, clever, inventive and enough twists and turns to constantly surprise. 8. When The World Was Young – Walking Into Clarksdale – Similar to Blue Train from the same album but just edges that one out for me. Jimmy’s laid back filling around the main melody has his signature all over it and is something no-one else can pull off in the same way. Instantly recognisable Page – brilliant! 10. Damask – Lucifer Rising – Proper scary stuff! Listen to this as a soundtrack to some of the biblical weather we’ve been having in the UK recently and it’ll feel like the end of the world is nigh! Robert Plant and the Sensational Space Shifters are set for appearances at the Summer Sonic Festival in Tokyo and Osaka, August 16 and 17. This will be Robert’s first appearances in Japan for 18 years. 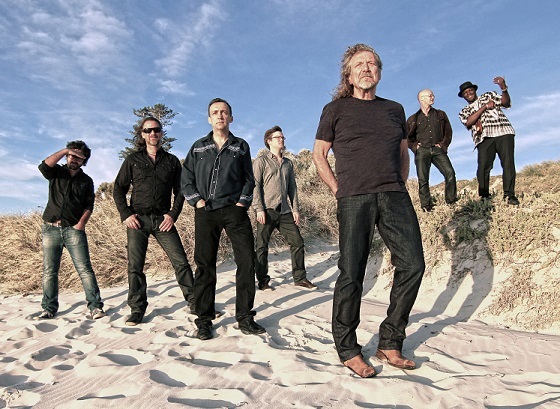 Robert Plant and the Sensational Space Shifters have just announced their initial 2014 European tour dates – this includes a prestigious date at Glastonbury Abbey on August 9th. More dates are to be announced. Not the best of starts to the year here with one or two domestic problems to sort and other things that have caused some stress…however I aim to get positive pretty quickly as it needs to be ever onward with a big workload ahead …and there is a lot of planning to be done re the TBL 2014 schedule. TBL 37 needs to get under way and I’ve also carved out a tentative plan for the next book I will be writing and collating throughout the coming year…and perhaps unsurprisingly this will be….. Already much requested and a logical subject matter given next year’s 40th anniversary of these epic shows – I will be turning my attention to producing a detailed chronicle of this era in the same style as the Knebworth and Feather In The Wind titles. This is all a long way off yet and publication is planned for mid 2015. I’ll be revealing more on this soon. I am sure you will be doing the same as we celebrate the 70th birthday of the one and only Lord Of The Strings…..
Dave Lewis/Gary Foy – January 9th, 2014. CW says it nicely below “magical, mystical guitar wizard” Yep! The zoso tattoo on my shoulder still looks as fresh as it did 23 years ago – definitely some magic going on there! It starts conversations with other Page fans too, which is the really magic part. Hearing “Achilles Last Stand” changed the course of my life and made me want to play guitar. I specifically wanted to learn how to play that song. But the thing playing Jimmy’s songs is you can play the same notes but never come close to capturing his feel. He plays so freely and by the seat of his pants, never knowing where he’s going next. That’s something you can’t capture even if you play 10 hours a day for a year. Happy Birthday, Jimmy. You’re the best. Having just read the ‘Uncut’ comments from Mr.Plant, I really cannot believe he really means what he says ie : ” We’ve been all around the world, setting places on fire,” says Plant, “and it’s so much better to do that than to bathe in the tepid bathtub of old hits. And to post his 2014 Tour co-incidentially on the occasion of Jimmy’s 70th birthday. When Robert commented, “Japan…wonderful place” at the Festival Hall, Osaka, 29 September, 1971, the last date of their sensational first Japanese tour, it sounded like he meant it. He seemed to embrace all things Japanese then. But lately, he looked like he was disenchanted with them all, especially since he had pulled out of the proposed June 1999 Japanese leg of Page/Plant’s Walking Into (not-)Everywhere tour. Japan, for a long time, became an irrelevant place to play for him. So, this announcement of his forthcoming return to Japan, seemingly out of the blue, is a pleasant surprise for many loyal fans over there. I hope it will rekindle his old affection and lead to more visits to play. The only snag is that it is unlikely for me to be in my country around that time…sigh. Best happy birthday wishes to undoubtedly the coolest septugenarian on the planet. Aging gracefully has never been done with with more style and elan. Thanks for keeping the dream alive and always staying true to yourself and your fans. I will always cherish the memories of your music and fantastic playing. I raise my glass to Jimmy Page. Many happy returns. God bless. It’s great to see Jimmy alive and well at 70. At some point back then it didn’t seem likely… I just hope he finally manages to put some ‘new’ stuff out whether it’s a fresh recording or something from his vast archives. It’s more than about time to let people hear more of what it’s been locked away for so long! Forget Clapton – Page is God ! It all begins and ends with Jimmy…Happy Birthday and THANK YOU for providing the soundtrack to my life! Oh jimmy! Happy birthday!What an excuse! Still relevant as can be heard at the O2 Where he was still pushing the boundaries sonically.The further i get from the first time i heard Led Zeppelin’s records the more amazed i am by what we all took for granted,an almost perfect run of records, effortless cool and a sound that hasn’t dated one iota.All the best Jim from this grateful fan. Happy Birthday Jimmy ! Time to assemble the guitar army for one last battle ! If John Lennon’s quote of “Before Elvis there was nothing” rings true for the birth of the sixties, then we should all be reminded – “No Jimmy Page, no Led Zeppelin = no Sabbath, Queen, Thin Lizzy, AC/DC, Rush, Van Halen, GNR, Bon Jovi, Def Leppard ETC, ETC”.. He fused the greatest band ever, played wonderful guitar, and is a top class producer (underrated in my opinion). “Lord of the strings…” so right on! Thanks for the tight but loose birthday tribute to Jimmy Page, Dave. Still trying to get my mind around the fact that the Riffmaster General is a septuagenarian. It ages us all really. In so many ways he’s still the magical, mystical guitar wizard in a dragon suit – that’s obviously his most lasting image from those halcyon days when giants literally bestrode the rock world. For sure it’s a major milestone for Heston’s most famous and celebrated son. Outside of my family, the single most important person in my life, and I know I’m not alone in saying that!